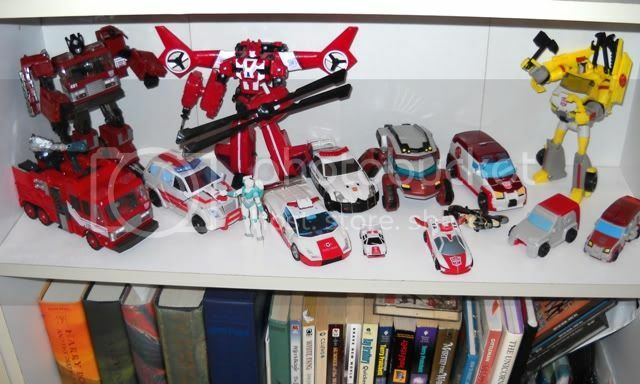 Here's my modest collection of Transformers. Started in late 2008 with the Animated line and Emergency vehicles. 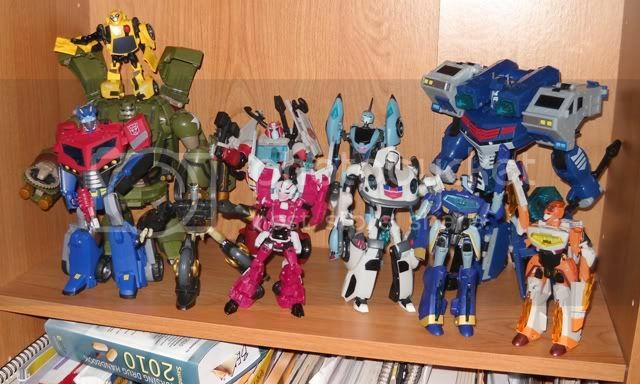 Leader Bulkhead w/Activators Bumblebee, Voyager Optimus Prime (w/ Deluxe OP's battleaxe), Deluxe Prowl, Deluxe Ratchet, Deluxe non-matte Arcee, Deluxe Blurr, Jazz, Leader Ultra Magnus, and the Jettwins. 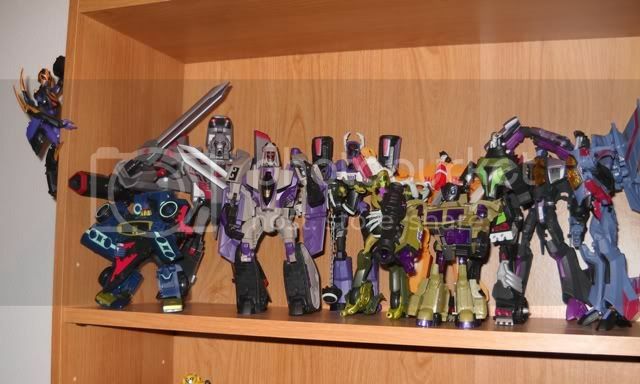 Blackarachnia, Megatron, Soundwave, Target exclusive Shockwave, Blitzwing, Sunstorm, Oilslick, Swindle, Lockdown, Skywarp, Starscream. Electrostatic Soundwave used to be up there, but he is in pieces awaiting a new paintjob. Voyager Lugnut (known as Failnut here in the casa de Kookaburra. Seriously, did ANYTHING in the design of this toy go right? 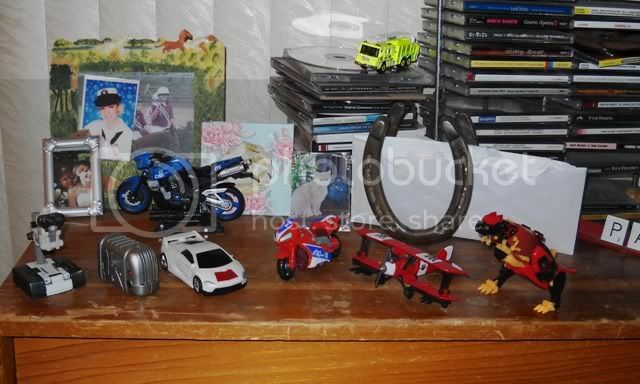 ), Voyager Grimlock, and Swoop and Snarl look up longingly at their mistress. 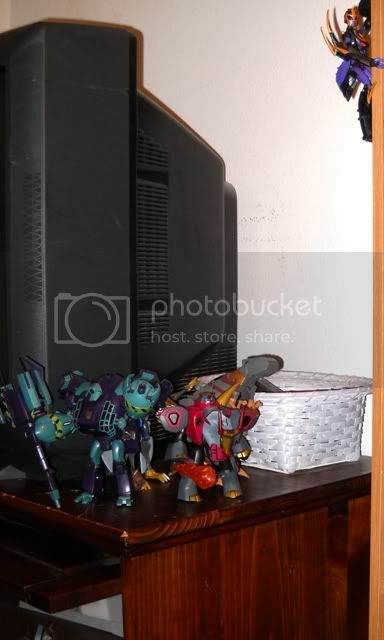 Lugnut thinks about plans for shoelifts so he can go squeeze in between Purplewave and Megatron. Scalpel, Ejector, Chromia, Brakedown, Reverb, Divebomb, and Fireblast Grimlock. The central space is reserved for Hubcap. 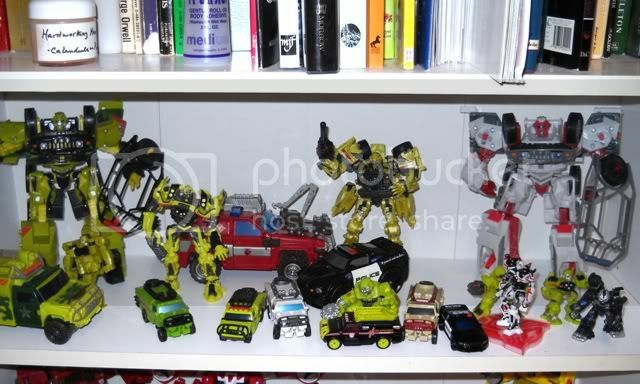 Movie (IE: Ratchet and Barricade) Emergency Vehicle shelf. 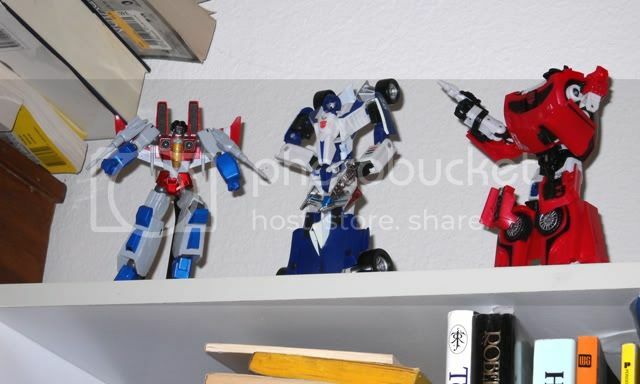 Night Ops Ratchet is supposed to arrive next week from TRU, and will take the place of honor in the middle. Maybe Hasbro will decide to ship Evac to Oregon at some point so I'll be able to break up the chartreuse monotony. 4,001 pages were recently viewed by 638 unique visitors. This page was viewed 1 times on Wednesday, April 24th 2019 10:47am CDT. © 2019 Seibertron, Inc. DBA Seibertron.com. All Rights Reserved. Established June 2000. Seibertron.com is owned by Ryan Yzquierdo.